5-Elementz formed in Detroit in 1992. The group met while attending Osborn High School on 7 Mile. The original members consisted of Thyme, Proof, Mudd, Jay Dee & DJ head. 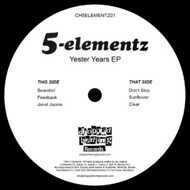 They recorded the "Yester Years" EP in 1993-1994 and dropped it on Cassette later in 1996. There was also a very limited Test Pressing version. Chopped Herring had access to the original studio DATs and presents to you the original EP plus an extra, previously unreleased Jay Dee heater. Ya better don’t sleep!